Copies of the Time Magazine cover, dated March 1, 2009, were seen hanging prominently in at least four of President Trump's golf resorts, flanked by other framed magazine pages celebrating Trump, his family, or his companies. Only problem, as the Washington Post discovered, it's not real. 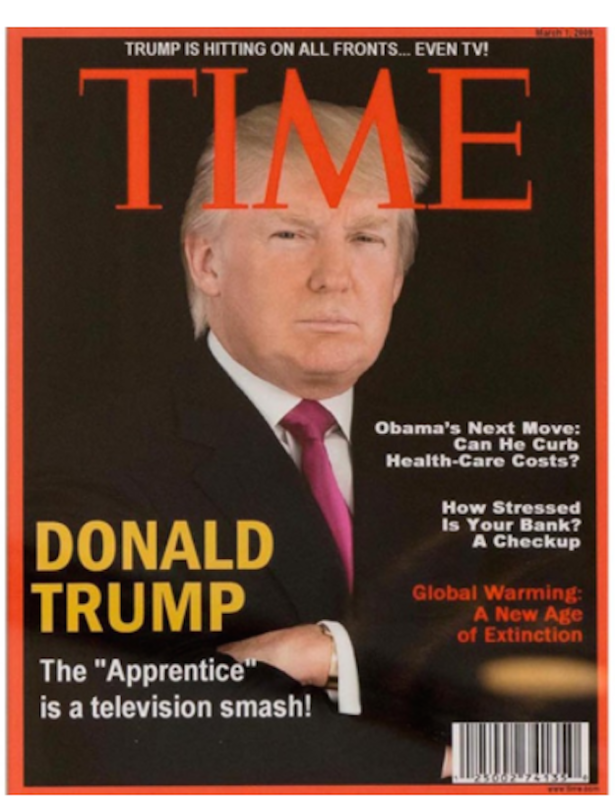 There was no March 1, 2009, issue of Time Magazine, and Trump did not grace the cover at all that year. However, his show, The Celebrity Apprentice, did premiere on March 1, 2009. A spokeswoman for Time Inc., confirmed to BuzzFeed News the magazine cover was a fake. The company has also asked the Trump Organization to remove the doctored covers from all locations where it is displayed. The manufactured cover's red border is thinner than the real thing, the headlines are stacked in the wrong place, and it features two exclamation points — one of Trump's favorite punctuation marks but not usually found in actual Time headlines. The cover, which declares: “Donald Trump: The ‘Apprentice’ is a television smash!,” was spotted at two locations inside Trump's resort in Doral, Florida; hanging in the dining room of the Trump golf course in Loudon County, Virginia, and at golf resorts in Ireland and Scotland, the Post reported. It was also spotted at Trump's Mar-a-Lago estate, the Florida estate he visits often when he's not at the White House. The Tampa Bay Times' Scott Keeler said he took this photo on assignment last July. 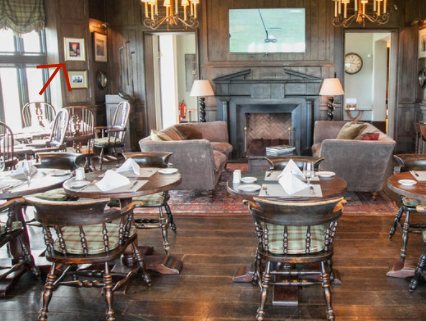 Photos from TripAdvisor also show the fake cover hanging near the fireplace in Trump’s golf resort in Doonbeg, Ireland. The White House and Trump Organization did not return BuzzFeed News requests for comment. Here are all the Time covers from 2009. On its March 2 issue, the magazine highlighted Kate Winslet for winning the Academy Award for best actress. Employees at Trump's Turnberry club in Scotland told the Post that the cover was added to a wall after Trump purchased the course in 2014, but it was taken down a few weeks ago. The fake cover also went missing from Trump's Ireland resort, but a bartender found it in a manager's office. Club officials don't know why it was moved there. Trump has often touted his consistent Time cover appearances. While speaking at CIA headquarters in January, he falsely claimed, “I think we have the all-time record in the history of Time Magazine.” Former President Richard Nixon actually holds that title, appearing on the cover 55 times. To date, Trump has appeared on 14 covers, only one of which was before he got into politics. And this isn't the first time the president has been mixed up with a doctored copy of Time. Last month, one of his deputy national security advisers reportedly gave him a fake Time Magazine cover that was supposed to be an example of mainstream media hypocrisy. A White House official said it was a mistake.